1. CG610S-D Fluid Loss Additive is only suitable for dry mixed, not easy to damp and cake and has long expiration period. 2. CG610S-D Fluid Loss Additive slurry system has wide applicable temperature range and it's resistant to high temperature. 3. CG610S-D Fluid Loss Additive has salt resistance. It's efficient in saturated brine. 4. CG610S-D Fluid Loss Additive slurry system is stable with little free fluid. 5. 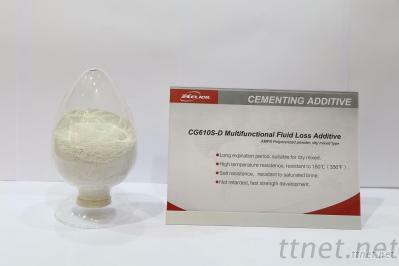 CG610S-D Fluid Loss Additive slurry system is not retarded, fast strength development. 6. CG610S-D Fluid Loss Additive slurry system has excellent rheological behavior. It generally doesn't require adding dispersant.